Coleraine will travel to Norway for Thursday night’s Europa League clash against FK Haugesund without the services of both Chris Johns and Lyndon Kane. Goalkeeper Johns is unable to travel as he sits A-Level exams, meanwhile defender Kane suffered a broken metatarsal in Saturday’s pre-season victory over Derry City. 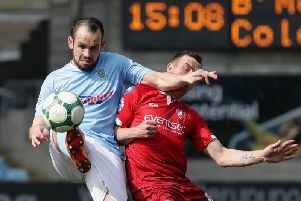 The loss of both players is a major setback to Oran Kearney’s men as they prepare for their first European match since 2004. “Lyndon picking up an injury is a blow as he was flying and is a major part of our team,” Kearney told the news Letter. “We are gutted to be losing him for a number of weeks, but he will come back stronger. Fans’ favourite Johns will also not be in the panel which leaves for Norway on Wednesday. This will mean a recall for veteran shot stopper Michael Doherty, who played the first-half against Derry City. “It would have been nice for Chris to be able to play and we are gutted for him,” Kearney said. “However, it will present a nice opportunity for Michael who probably deserves that for his devotion to Irish League football. The Bannsiders prepared for Thursday’s fixture with a victory against Derry City at The Showgrounds. Eoin Bradley’s 86th minute header was the difference between the sides, with attention now turning to Europe.